Last Thursday’s matchup between L-S and English Valleys had extra significance as both senior night and a “pink-out” for breast cancer awareness. The Hawks swept EV in three matches, making it a quick night as they did not let EV score more than 15 points in a set: 25-10, 25-15, and 25-10. Everything seemed to be going well for the Hawks on senior night. The three seniors played a huge role in the game, particularly from the service line. McKinley Conover was 17-of-18 in serves, Camryn Russell went 22-of-23, and Skyler Young went 20-of-21. The Hawks as a team were 94 percent from the line, making 85 of 90 serves. L-S also had 12 aces. Senior McKinley Conover goes up for a hit against English Valleys at Pack the Stands with Pink Night. Junior Shiloh Cunningham and freshman Krystal Van Dyke form a wall at the net in last Thursday’s match against English Valleys. Conover led the team at the net with 10 kills. Another top attacker was junior Carson Fisk with six kills on the night. The Hawks had 29 total kills. L-S also had 64 digs. Conover led the team in this category with 19. Fisk was right behind her with 11 digs. Freshman Krystal Van Dyke led the team with six solo blocks. L-S had 10 blocks. Young had 22 of the team's 29 assists. Coach Jayme Deal said the Pack the Stands with Pink match was a “great night” for L-S. The Hawks faced a more challenging conference team on the road at Keota on Monday, Oct. 9. Still, the girls came out on top and defeated the Eagles in three sets: 25-21, 25-23 and 25-15. L-S had another solid night of serving with a 94 percent success rate (80 of 85 serves). The Hawks totaled four aces, two of those coming from Russell. Conover was a big contributor, successfully serving all of her 22 serves. Loftus slammed eight kills down on the Eagles, and Cunningham also had a strong six kills. Together, the team rounded up 24 kills. Loftus also excelled on defense, giving the team four of its nine blocks. Russell and Cunningham each had two blocks. Young had 18 digs along with 20 assists. The 13-11 L-S girls were scheduled to be at Belle Plaine playing Tri-County on Tuesday, Oct. 10, with the winner playing Belle Plaine in a second match to determine placement in the west side of the SICL. Thursday, Oct. 12, will be the crossover quad tourneys to determine final placements in the conference (site and opponent TBD). Regionals start at home next Tuesday versus Collins-Maxwell. The Hawks continued their competitive week into the weekend and traveled to Davis County on Saturday, Oct. 7. They split 2-2 at the end of the day after facing a combination of 1A, 2A, 3A, and 4A schools. 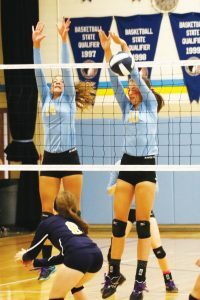 The first match was against New London, who gave the Hawks a loss in two sets. L-S followed the loss with two wins, defeating Centerville and Albia. This sent the Hawks to the winner’s bracket. The semi-final game was against Iowa City, Liberty. L-S then lost a close, exciting game in three sets. The New London Tigers are ranked No. 5 in class 1A and showed up ready to play. The Hawks dropped the first set by a score of 21-6 and the second by a score of 21-7. The Hawks started out slow, but some of the bright spots for the Hawks were their serving and also their digs. The serve efficiency for the game was 100 percent, and the Hawks had four girls with seven or more digs: Seniors McKinley Conover and Skyler Young and juniors Makayla Rozendaal and Shiloh Cunningham. Against Centerville, the Hawks led the whole first set and won 21-11. L-S won the second match as well, 21-19, giving them the win. The Hawks had three girls perfect from the serve line, Conover, freshman Korinne Jansen, and M. Rozendaal. Senior Camryn Russell had a successful three aces and five digs. Conover came up strong, leading the match with five kills. Cunningham contributed four of the team's eight blocks, with two more coming from sophomore Mallory Loftus. After the victory, the Hawks were able to keep it rolling against 2A Albia, winning 21-11 in both sets. For both of those sets, the two teams were well-matched until the score hit 5-5, when the Hawks went on big runs to take the win. Both Loftus and Jansen hammered down four kills. Junior Carson Fisk fired four aces over the net and helped defend with six digs. Senior Skyler Young tallied up 14 assists and had seven digs. The semi-final match was the only three-set match of the day for L-S. It was a back-and-forth battle throughout the first game. L-S pulled through and took the first set win 26-24. Liberty started out the second match with a 5-0 start before an L-S timeout. The Hawks couldn’t overcome the five-point deficit from the beginning of the set, losing 25-18. L-S lost the third set as well, ending their day. Despite the loss, it was still a successful game for the girls, totaling 21 kills, including nine from Loftus. The Hawks also accumulated 80 digs, Young and Conover each with 16. Cunningham and Russell came together, each contributing four blocks to the team’s eight. 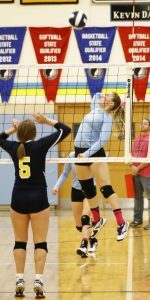 L-S successfully served 54 of 56 serves, with sophomore Janelle Rozendaal making 17 of those serves. “The first game, we did not play our best, but they were a very good team. Then the rest of the day, we did much better. Our game against Centerville, we played well and did a good job of defending at the net and also digging up the kills. I thought we had a good serving day overall, too. We blocked well against Liberty, but came up just a bit short of winning,” said M. Rozendaal.